One more time, after going through the closed gates I enter this strangely silent place. Once again all you can hear is the birds’ sing who have set their nests on the top of the factory buildings. Decades of intense industrial activity remain present on the polluted grounds. Those are now mixed with high grass and all kinds of colours. Nature claims its place back as quickly as possible. A creaking sound comes out of the door as it opens. Then the sound of broken glasses laying on the floor follows my steps. I’m inside the control room. 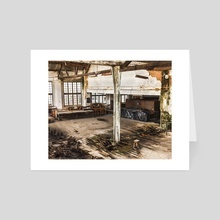 No strangers allowed to come in – this is the room where engineers operated the factory where thousands of people used to work day and night, weekends included. Now there is nobody else left. A solitary journey has been set to discover four of the biggest industrial icons of Portugal’s recent history, and nowadays transformed into archaeological areas falling apart piece by piece. These have been companies who’ve affected the daily lives of nearly 30.000 people on its peak. Many of them migrated from the farming lands in the countryside and found a different life when coming to work in the new industries. Lisnave (shipbuilding), Companhia União Fabril (chemistry), Mundet (cork manufacture), Siderurgia Nacional and its blast furnace (steel plant) became not only companies but small empires and deeply changed the dynamics of Portuguese economy as a whole. They’re all located in the very south of Lisbon, along the Tagus river, whose quick access to the capital’s harbour and to the Atlantic ocean was seen by these major industries, now photographed, as a strategic point to be located. That was not a coincidence. It had been a strategic point since the 15th century, when the Portuguese sailors entered the caravels and embarked on this same river to start several journeys across all the oceans and continents of the planet that would completely change our perception of the world. This is an unsigned and open edition print. For limited signed editions, and larger sized prints, please contact the photographer. 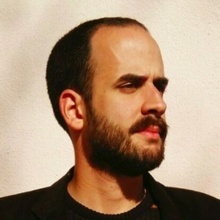 Nuno Perestrelo (b. 1988) is a freelance photographer based in Madrid, Spain. He was born and raised in Portugal and has wide international experience. Educated in Communication and Journalism, with a bachelor’s degree in Communication Studies and an international Master of Arts in Photojournalism, he has lived and studied in Portugal, Spain and Sweden. He first started out as a journalist, writing for local and national media, and then from 2010 he devoted himself exclusively to photography. His photographs have been exhibited and published in Sweden and Portugal.